The reference images used for backgrounds in today’s strip are courtesy of the esteemed Gordon McAlpin, who does the phenomenal webcomic Multiplex. Because he is a master of photography and he was going to be in Indiana University to visit his brother, he offered to take some photographs of Read Hall for me. There’s a lot of angles that you just can’t get from Google Images or Google Maps Street View! And so he got me hundreds of images of the entire damn exterior of the building. This was amazing and incredibly helpful. It was also really nostalgic. I haven’t been to Bloomington since 1999. I used to live in this building. It’s nice to see it again, albeit a decade removed. Thanks, Gordon. My memory (and Google) only serve me so well. I recommend his first book collection. 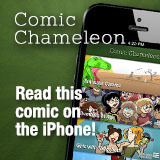 I’ve got a copy, and among webcomics collections it’s the cream of the crop.